A member of the Outdoor Writers & Photographers Guild had two of his books chosen as wedding presents for the Duke and Duchess of Cambridge – by the Prime Minister. Photographer Glyn Davies’s two tomes of Anglesey Landscapes were ordered by David Cameron’s staff on Wednesday. The 46-year-old’s two books each contain landscape pictures of the island, where Prince William is based as a Sea King helicopter pilot with RAF Valley’s search and rescue service. The Anglesey-based photographer told the BBC: “As islanders we have all sort of got used to the fact Will and Kate are hereabouts and we mostly take it all for granted now, but it is nevertheless a huge honour that the prime minister had thought about my books and artwork in the first place, and that he believes them to be a fitting ‘extra’ gift for a royal couple. David Allan, the chair of Mountain Rescue England & Wales, was a guest, along with his wife Sheila, at the ceremony today in Westminster Abbey. 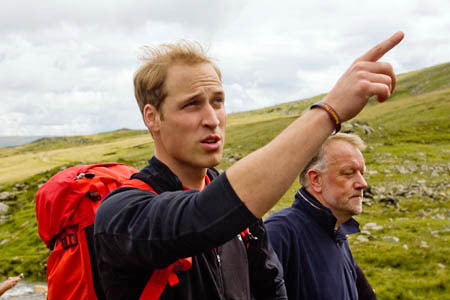 Prince William is patron of the MRE&W, the umbrella organisation for the voluntary mountain rescue teams and RAF team members south of the border. Mountain Rescue England & Wales issued a message today to the royal couple: “Congratulations to our patron, HRH Prince William of Wales and Miss Catherine Middleton on this their wedding day, Friday 29 April 2011. 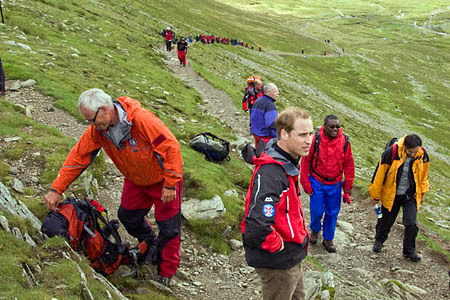 Also invited to the wedding, which drew crowds approaching one million along the route in central London, was Seyi Obakin, chief executive of the Centrepoint charity for the homeless, who climbed Helvellyn with Prince William and members of the charity in July 2009. The Duke of Cambridge is also patron of Centrepoint. The ascent was made with volunteers from the Lake District’s mountain rescue teams. Campaign for National Parks president, broadcaster and adventurer Ben Fogle, was also in the congregation for the wedding.